I took the British Airways flight from Hyderabad to Chicago via London on the 23rd. I reached Chicago on the 23rd evening local time. Rich Berkowitz, an old friend from the internet - I have exchanged dozens of emails and had many Skype calls with him - picked me up from the airport and showed me around the city. It was the first time I was meeting him in person! Rich is on nocturnal home hemo in Chicago and along with Bill Peckham was one of my go-to experts on home hemo when I was just starting out in 2006! Rich took me to a great pizza place called Giordano's and we had some great stuffed pizza. During the meal, we chatted a whole lot about what else - dialysis! Well, suffice it to say that I am not the only person on earth who is fed up of dialysis! 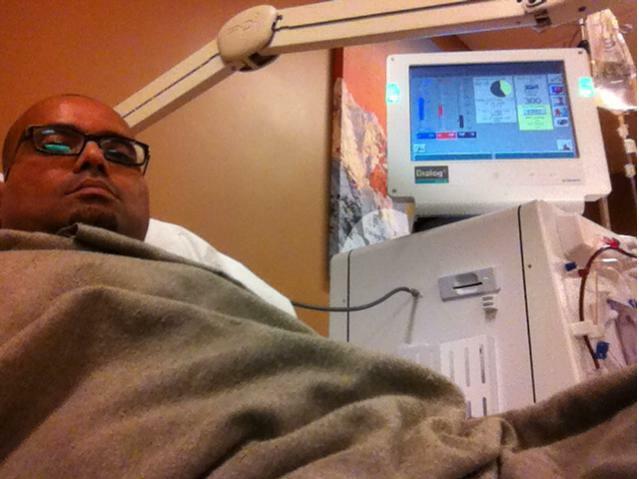 The next morning I had dialysis scheduled at 11:30. I took a cab and went over to the dialysis center. When I checked my weight, I was surprised to see that it was about 6 kgs over my dry weight. I realized however that when I weigh myself at home, it is in my skimpy little boxers and T-shirt! Here, I was wearing heavy denims, a thick T-shirt and shoes. However, there was no way to tell the actual weight. I guessed and decided to pull off about 4.5 kgs! Not a good decision. About three hours into the session, I started feeling dizzy. My Blood Pressure had plummeted to 82/43!! The machine was set to a minimum UF, saline was infused and the BP rose to a respectable 90/50. In the process, however, I lost only about 3 kgs. The dialysis center I went to had one really experienced nurse who was from Philippines. The Filipinos are the American equivalent of the Indian Malayalees! They are very good as nurses in healthcare, have a thorough knowledge of medical protocols and most importantly, are very caring and compassionate. The nurse I was treated by had one problem though. She used the same silly jokes with all the patients - she called all the male patients "Boyfriend" and she would say something on the lines of, "I am going to return all your blood because I don't want to owe you any blood!" That evening I met with Dori Schatell, who runs the Home Dialysis Central website. Dori is also someone I have been in touch with over email and calls from 2006! I was very excited to be finally meeting with her in person. Dori, Paul Bennet, a Hemodialysis professor from Australia and I formed the sub-group that dealt with Psychosocial Factors in Home Hemodialysis. At the pre-meeting dinner, I got a chance to meet with some of the stalwarts in home hemodialysis from around the world. I had a long chat with Dr. Robert (Bob) Lockridge, one of the legends in the Home Hemodialysis world! One problem I have with foreign travel is the food. My Indian palate is used to spices and a certain style of cooking. The pre-event dinner had an elaborate spread - most of it was non-vegetarian though! For me, they had some vegetable stew. I hungrily ate up the entire bowl. Within half an hour I was thoroughly nauseated! This was just not my kind of food! I went back to the hotel room and took an anti-emetic and went to sleep. The next day was the main meeting. Dr. Christopher Chan, another great name in home hemodialysis introduced me to the rest of the participants. I was very thrilled with the attention! The meeting went off very well. I felt that this was a great opportunity for me to give back, in whatever way I could, to the modality that has given me my life back. I had heard a lot about Chicago's pizzerias. When I looked up the internet for recommendations for the best Neapolitan pizzas, Spacca Napoli kept popping up. Once we were done with the meeting, I asked Google Maps for help and successfully changed two trains and walked right up to Spacca Napoli and had the Margherita pizza (Neapolitan style). It was the best pizza I had ever had! 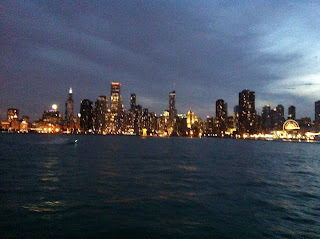 I then took the trains and a bus to the famous Navy Pier and took a boat ride that showed you Chicago's Skyline. It was a good ride! Here are some pics from the boat that I took. By the way, this was probably the first time that I did anything like this on my own. During my last trip to the US, I was always with family or friends. On this trip to Chicago, I was on my own. I walked the streets, asked around for the location of the train stations, got advice on the tickets and more. This gave me a true flavor of what the city is like! Chicago is really a very beautiful city! 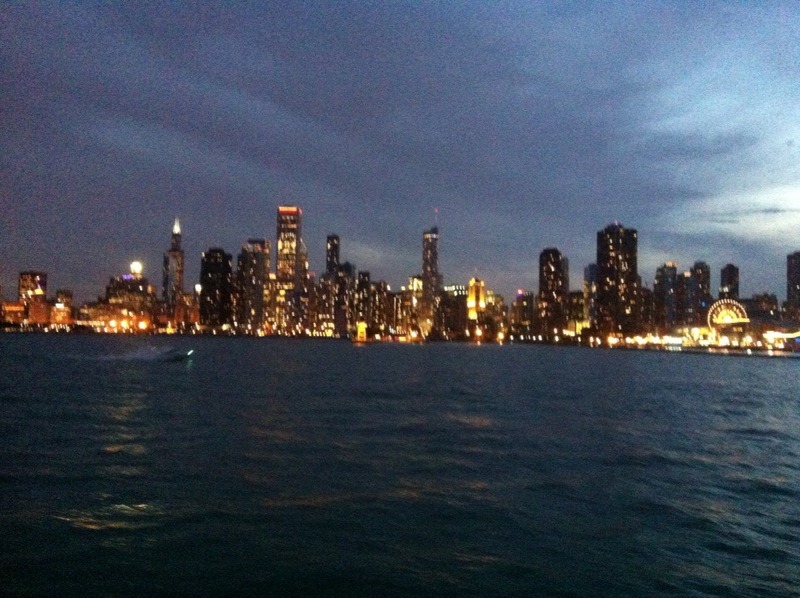 Chicago's skyline boat ride is best at nights. I missed it in my last visit.